Shark SharkFLEX DuoClean Review – Is This Corded Vacuum For You? The Shark SharkFLEX™ (HV391 model) is a very powerful and lightweight vacuum cleaner designed for cleaning the modern home. Today’s homes have a variety of floors as well as other surfaces like sofas, chairs, and window coverings that all collect dust. Plus many families have pets which tend to shed their hair and dander all over the house. This presents a problem that vacuums of a few years ago were not equipped to deal with. These traditional cleaners were large and clunky making them difficult to move into tight spaces. This is where an innovative company like Shark can really shine. The SharkFLEX operates in a variety of modes to handle these various surfaces. You can use it in standard upright mode for larger, more open areas with either carpets or hard floors. Handheld mode is perfect for quick messes or tight spaces where you just cannot fit a large vacuum head into. Take the Shark into your car as well, giving you the ability to keep the interior free from dirt and dust on a regular basis. The unique MultiFLEX technology lets you bend the wand at an angle so you can slide the cleaning head under items that you previously could not. This feature alone provides a degree of cleaning that no other brand can boast but there is much more. DuoClean is what Shark likes to call the dual brushroll design of the head on their vacuums. The main reason for this is to allow it to be used on carpets and hard floors, picking up a variety of debris. The hard bristle part works on embedded dirt by agitating the carpet fibers, so the dirt can be pulled up by the powerful suction. This works similar to the typical standard upright vacuum cleaner, or one that is designed for large household cleaning. The soft brushroll is really what makes the DuoClean feature work as well as it does. It actually serves two purposes when moving over smooth floors like tile, hardwood, linoleum, and laminate. First it will compress down so it has room to pull up large sized objects and piles of dirt. And second, it will attract fine dust particles to leave the surface looking like it was just polished clean. It’s a unique way to make sure you can use the same vacuum on just about any surface in your home without any changes or new attachments. You might be wondering what the difference is between the SharkFLEX and the IONFlex 2X stick vacuum? Really the only difference is the fact that the SharkFLEX is corded while the IONFlex comes with 1 or 2 lithium ion batteries, depending on which model you choose. Obviously the SharkFLEX won’t need to be charged and can run as long as you need it to but you are also confined to using it near an electrical outlet. There are slight differences in terms of accessories as well so you need to look over what is included when you decide on which model is best for your household. The filtration system on the lightweight Shark HV391 vac is fully sealed and called their Anti-Allergen Complete Seal. The filter is rated to capture 99.9% of harmful allergens like dust mites, pet dander, and pollen particles down to 1 micron in size. This is one of the reasons why they state the SharkFLEX is designed for households with one or more pets. It does a great job at removing pet hair and dander from all surfaces around the home. Plus it comes with their Pet Multi-tool attachment which has stiff bristles to grab stubborn hairs. MultiFLEX Reach Mode lets the vacuum bend part of the way down on the wand so it can reach under various items around the home. Under Appliance Wand easily fits under appliances like your oven which are always difficult to clean under. Pet Multi Attachment works like 2 tools in 1 with removable bristles for cleaning a variety of surfaces. Freestanding Upright Mode allows you to fold the top over for compact storage when not in use. Bright LED Lights are located directly on the floor nozzle to really light up the path in front of the cleaner. Noise Reduction Technology keeps the sound lower even when vacuuming at full power on carpets or bare floors. Light Weight Design of just under 10 pounds means you can carry it around your home as needed. Is It A Good Choice For Your Home? The Shark SharkFLEX is a corded lightweight vacuum cleaner that can be used in a variety of configurations. You can use it in handheld mode, full upright mode, and various FLEX modes to reach just about any area of your home. It’s a great choice for the household with pets, especially those with a variety of floors. However if you have a larger home with mostly carpets, especially thicker ones then it wouldn’t make an ideal choice. 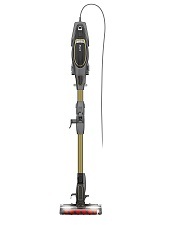 You might want to consider the Shark Navigator upright which is one of their full sized upright vacuums with enough weight and power to pull dust up from the depths of carpet fibers. To learn more about it and check current online pricing, click here to visit our recommended supplier.